Enjoy with clear conscience from the glass. Climate change is one of the greatest challenges of our time. We will meet this challenge with our innovative beverage concept. As an innovative company, we strive for constantly improve of our products and technologies – based on the needs of our customers and in harmony with our environment. Our ecological footprint is 90% smaller than bottled drinks, although the bottle itself has been calculated with a life cycle of 50. Also the CO2 footprint is 90% smaller than beverages in reusable glass bottles. 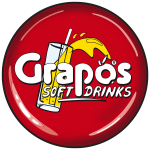 If all Austrians, once only, take a glass of “Grapos softdrink” instead of a bottled drink, the CO2 emissions-saving is as big as driving 63 times around the earth by car or flying 5 times to the moon*. It is therefore worthwhile to prefer the glass. 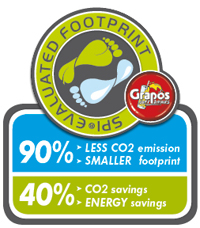 Each restaurant operator, using the “Grapos beverage concept”, saves up to 44% CO2-emission and 40% of energy in cooling drinks. Colds stores and drawers are not necessary because the dispensing unit directly cools the taped softdrink. So you save the investment of expensive cooling technology and also high energy costs. 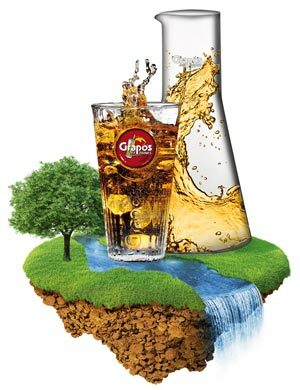 For the future any company, that uses the climate-friendly Grapos-concept, is allowed to inform their guests that they can actively contribute on climate change with each drink. This is good for image and sales – and especially for our planet.